Are Irises & Daylilies Poisonous to Cats & Dogs? Named for the Greek goddess who rode rainbows, iris species are toxic to all animals. With their spectacular and colorful blooms, irises and daylilies brighten even the most lackluster perennial bed or table top. But before you rush to incorporate these popular flowers into your home or garden, take note that both plants can pose hazards to our canine and feline companions. The large, eye-catching flowers and spear-like leaves of the iris provide an interesting multi-season dimension to any garden bed. 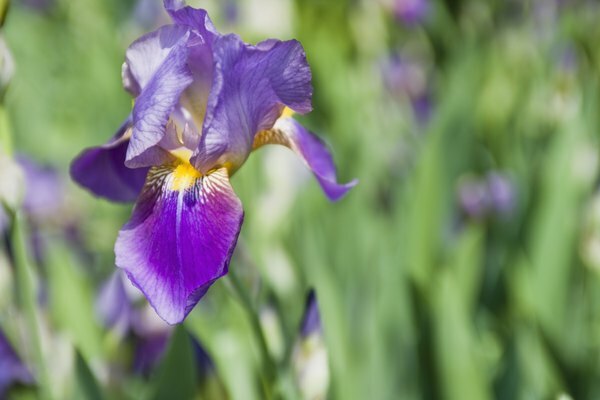 Unfortunately, irises -- as well as the gladiolus species, another member of the iris family -- are toxic to all animals, including dogs, cats and even cattle. Scientists have isolated a number of toxic compounds, most notably irisin, terpenoids and quinines. These toxic compounds occur in highest concentrations in the rhizome, or rootstock, and bulbs, but are found in the leaves as well. Consumption of irisin -- thought to be the primary toxic agent -- and pentacyclic terpenoids cause increased salivation, diarrhea, vomiting, decreased appetite, ulcers and bleeding of the stomach and small intestine. The severity of these symptoms depends on the amount, and part, of the plant that is consumed. Pets that have ingested iris should be made to regurgitate and treated with activated charcoal to reduce absorption of these toxins. If needed, medicines may be used to reduce nausea and vomiting and treat ulcers. Thankfully, iris toxicity is generally considered mild to moderate, and short-lived. Not true lilies at all, daylilies are members of the genus Hemerocallis, a Greek term meaning "day beauty." But admire these beauties from afar if you share your home with cats, as just a few bites of the leaves may lead to life-threatening kidney disease. The toxic agent has yet to be identified, but all parts of the plant, including leaves and flowers, have been shown to be toxic to cats' kidneys. While not toxic to dogs, daylilies can cause an unpleasant, upset stomach if your pooch gorges himself. Symptoms of drooling and vomiting often occur within two to 12 hours of a cat having ingested daylilies. Depression, lethargy, loss of appetite, tremors and seizures may also occur. Without immediate treatment, acute kidney failure will develop within one to four days. Fifty percent or more of these cats will not survive without dialysis or kidney transplant. If treated within six hours of ingestion, cats have a good chance of survival. Treatment consists of forced regurgitation and administration of activated charcoal, laxatives and enemas. If you suspect your pet has consumed a potentially toxic substance, immediately contact the ASPCA Animal Poison Control Center at (888) 426-4435. A $65 charge for the consultation may apply. If your pet is in distress, proceed directly to your pet's veterinarian or an emergency veterinary clinic. Always consult an experienced veterinarian regarding the health and treatment of your pet. How Much of a Lily Do Cats Have to Eat for Them to Be Hurt? Are Daylilies Toxic to Cats? Are Hosta Plants Dangerous to Dogs if Ingested? Are Hydrangeas Poisonous to Cats? Will Vinegar Neutralize Pet Urine Odor?